Cream Wine Company is an Illinois importer and distributor licensed to sell to valid on-premise (restaurant) and off-premise (retail) customers. Only licensed and approved Cream customers can place orders and receive deliveries. We cannot sell direct to consumers. Consumers are welcome to inquire where desired products represented by Cream can be purchased in Illinois. Cream Wine Company offers next-day delivery service 5 days a week to the Chicagoland area. 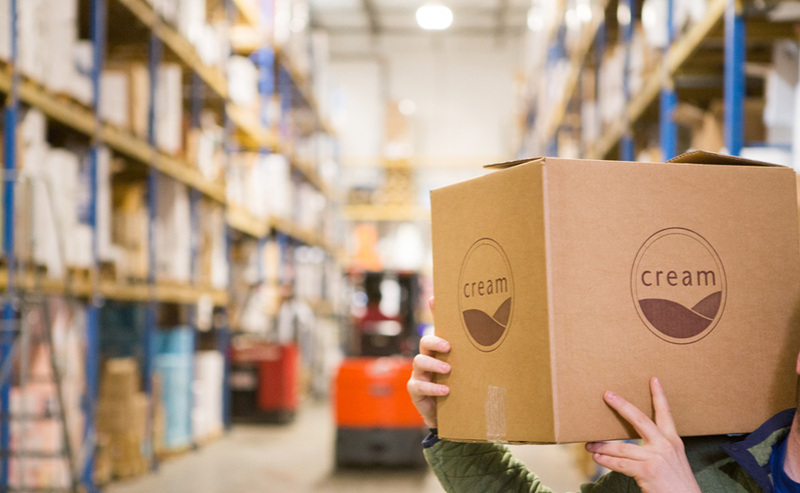 Cream endeavors to deliver as much product as possible with our own temperature-controlled delivery vehicles. Generally, in the Chicago and the near North Shore you will see a Cream truck on a daily basis. Chicago Messenger Service and Chilled Solutions, third-party delivery services, are used to deliver to areas in which the Cream trucks cannot easily reach or to assist during high volume delivery days. Monday Delivery Cream offers Monday delivery service for Chicago city addresses for orders received any time Friday through Monday morning. The time cut off for Monday morning same day orders is 9:30am. Regular Zones: Tuesday to Friday Delivery Daily service for regular delivery zones extends as far North as Libertyville, as far West as St. Charles and as far South as Frankfort. In addition, there is daily service to Rockford. Western suburbs are zoned to received delivery Wednesday and Friday. Northwest suburbs are zoned to receive delivery Tuesday and Thursday. Cut off for next day delivery is 5:30pm. Remote Zones: Thursday Delivery Chilled Solutions delivers to remote zones: Dekalb, Champaign, Urbana, Bloomington, Springfield, and Peoria. Orders must be placed by Tuesday of that week for Thursday delivery. Product Returns Cream Wine Company only accepts returns that are authorized in advance, as proper documentation is needed to make the pick-up. Please contact your Cream Sales Representative or Customer Service if you need to return an item. You will receive a credit memo within 24 hours of return of merchandise to the warehouse. Cream does not accept returns, either for credit or refund, for unsold items or items that we no longer stock at our warehouse. Breakage In accordance with Illinois law, Cream can only accept breakage returns at time of delivery. All cases should be opened and inspected by the customer at time of delivery to ensure all products are in good, saleable condition. Faulty Product Please notify your Cream Sales Representative of any faulty products. We may require return of the faulty merchandise in order to process a credit—particularly so if the item retails for in excess of $20. It is our preference to issue credit memos instead of physical replacements. Please tell your Sales Representative if you require a physical replacement. Depending on credit approval, payment terms are C.O.D. or Net 30. Cream reserves the right to set credit limits based on credit approval or standing. Cream accepts cash, check and electronic funds transfer payments. Click for the electronic funds transfer enrollment form. Payments can also be made through Fintech. Contact Mark Payne if you have any questions: mark@creamwine.com or (312) 421-1900. WSDI Delinquency List Cream delivers only to customers in good standing with the Wine and Spirits Distributors of Illinois (WSDI). The WSDI, by Illinois State Law, maintains a delinquency list of retailers that have not paid alcohol invoices by the statutory 30-Day period. Like all Illinois wine and spirits distributors, Cream is bound by these requirements. We receive the WSDI delinquency list electronically on Thursday afternoon and are not permitted to deliver to anyone on this list. Customers and their respective Cream Sales Representative are notified directly when this arises.